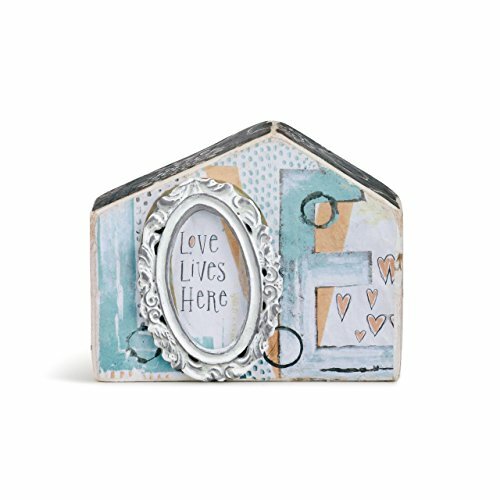 Demdaco Love Lives Here Patchwork Print Small Plaster Molded House Sculpture by Demdaco at N Online Agency. MPN: 1004360015. Hurry! Limited time offer. Offer valid only while supplies last. Collaborating across 2,000 miles over many months, artists Lisa Kraus and Lori Siebert created Story Homes, a collection symbolizing a place where love is shared, memories made, and comfort found. Unique, whimsical designs reflect the individuality of every home, making these pieces the perfect housewarming gift. Unique, whimsical designs reflect the individuality of every home, making these pieces the perfect housewarming gift. Sentiment reads: Love lives here, Lots of laughter tons of fun. Crafted with paper pulp of beautifully colored paper with patterns and formed with plaster, this house sculpture is individually unique. Great as a standalone, statement piece for feathering your nest with personality. Measures approximately 4 x 5 inches. Display on a table top, nestle in a shelf arrangement or mantel. From the Story Houses Collection for DEMDACO. Ships in protective packaging.